Jack’s Nadi’S Ilisoni Galala attacks against BLK Nadroga during the Skipper Cup Premier clash at Lawaqa Park, Sigatoka on April 13, 2019. 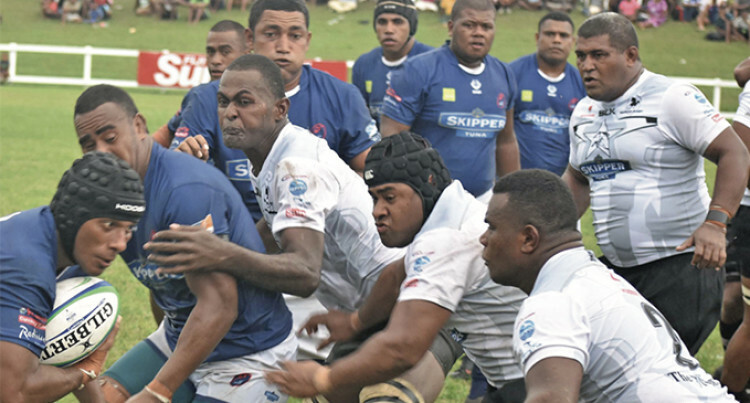 The Jolame Luvevou captained- Jack’s Nadi have set the Skipper Cup Premier alight with a 40-18 bonus point win over BLK Nadroga at Lawaqa Park, Sigatoka yesterday. The win was Nadi’s first at Lawaqa Park after a 10-year lapse. The last time they beat the Stallions 10-9 was back in 2008. What happened: In the first minute Nadi were penalised and Nadroga fullback Apisalome Waqatabu kicked it over for a 3-0. The match became scrappy as indiscipline crept into Nadroga’s game where veteran prop Setefano Somoca was sin binned. In the 9th minute Aminiasi Naituyaga scored in the corner as the hosts regained the lead 8-7. He was later sin binned for a professional foul. Nadi winger Tevita Mociu ran in a try and Taga made no mistake with the con- version as they led 14-8. Nadroga’s Aporosa Tabulawaki was sin binned for late tackle on Ilisoni Galala. Nadi capitalised from the set pieces and allowed Taga to score who also converted for a 21-8. Waqatabu closed the gap with another penalty 21-11 at the breather. In the second spell, the visitors continued to disrupt Nadroga’s set pieces, and Luvevou managed to score his second try which was converted. Former Nadi skipper Ron Katonivere came off the bench to score under the post with the conversion going over for a 35-11. Nadi centre Sela Toga also had his name etched on the score sheet. In the final five minutes the hosts replied with a try to Seru Raitala and was converted by Waqatabu. Other results: Nadi Women drew 10- 10 with Nadroga while Nadi Under-19 side edged out Nadroga 12-10.